Register Log In Primarily Petroliana Shop Talk Forums Petroliana Value Questions Found Mobil sign, trying to get a value. 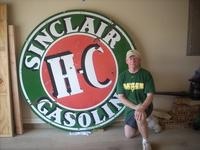 Found this Mobil sign in an old camper. Looking to find its value if there is any. Hi Jeremy...you may need to post a pic of the whole sign, a pic of the back of the sign, and list the measurements. Also can you tell if it is porcelain or painted? All of this info would help. Looks like a sign insert in a black frame. Is the sign itself metal, plastic or other material?